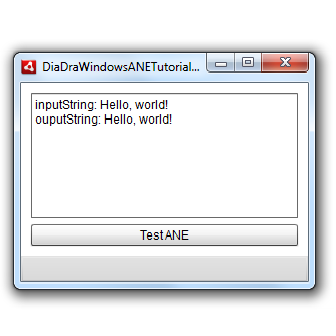 Download this ANE and source code if you would like a companion to our Windows ANE Tutorial. a PDF with instructions on how to use all this. Note: The tutorial shows you how to create an ANE for Windows step-by-step and having the source code upfront is not a prerequisite to that. Its sole purpose is to give you a kick start and save you time. This worked great for me Many thanks to the team!